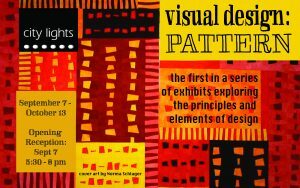 A new series of exhibits based on the visual elements and principles of design opens Thursday, September 7, 2017 from 5:30-8:30 pm at City Lights Gallery in Bridgeport. Executive Director Suzanne Kachmar is grateful to Jane Davila for contributing her curatorial skills to this collaboration which grew out of conversations regarding programs that explore the basic concepts of visual design. City Lights Gallery presents local, regional, and emerging artists to Bridgeport and its visitors. It provides opportunities for artists of all levels, backgrounds and abilities to present and sell their art. Artists selected to participate in this exhibit are showing both large and small works that highlight the many facets Pattern and Texture, rendered in a variety of media from fiber art to painting to weaving. Participating artists include Adger Cowans and Liz Squillace of Bridgeport, Gwen Hendrix of Oxford, Norma Schlager of Danbury, and Tim Reimer of Stratford, Jahmane West of Norwalk. The elements of design are “building blocks” and their arrangement forms the composition of a work of art. The principles of design are the guidelines used to arrange the elements into a composition. The elements of design are line, color, shape, value, size, and texture and the principles include balance, emphasis, harmony, rhythm, pattern, movement, proximity, repetition, variety, proportion, and space. This first exhibit explores the Pattern. The principle of Pattern is constructed by repeating or echoing a form, shape, symbol or mark to create a sense of balance, harmony, contrast, rhythm, or movement. PATTERN features 3 Bridgeport Art Trail artists. Adger Cowans resides in his Bridgeport studio. He is a fine arts photographer and abstract expressionist painter has experimented with a myriad of mediums over his artistic career. He was the first Black stills photographer in the film industry. He is renowned in the world of photography and fine art, his works have been shown by The Metropolitan Museum of Art, International Museum of Photography, Museum of Modern Art, The Studio Museum of Harlem, The Cleveland Museum of Art, Harvard Fine Art Museum, Detroit Art Institute, James E. Lewis Museum and numerous other art institutions. Liz Squillace in her studio. Liz Squillace also lives and works out of her Bridgeport studio and maintains a workshop in the historic downtown Arcade Mall. 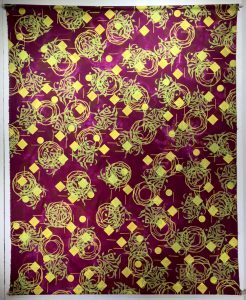 She is a painter, silkscreen printer and mural artist. 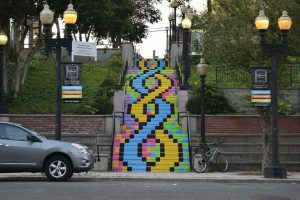 Her most recent work is the visual transformation on the steps between Golden Hill St. and Elm St.in downtown Bridgeport. CT. Words cannot do it justice. The steps connect Elm St. and Golden Hill St. leading you to City Lights Gallery. Attendees can enjoy the neighboring steps as an exterior focal point of the exhibit. 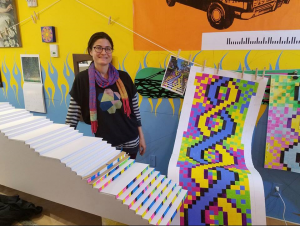 Co-curator Jane Davila is Bridgeport Art Trail working from her studio at the NEST Arts factory where she coordinates NEST art events and exhibits, teaches workshops, creates fiber art, prints, and graphic design work. Adger Cowans served in the United States Navy, he worked as a photographer before moving to New York, where he worked with Life magazine photographer Gordon Parks and fashion photographer Henri Clarke. He is the recipient of a John Hay Whitney Fellowship and the Martin Luther King, Jr., Caesar Chavez, Rosa Parks Visiting Scholars Award, Wayne State University.